You can no longer register for this event, because the maximum number of subscribers has been reached. BUT – the session will be filmed and broadcast live. You can follow the livestream here on 19 February. The second Inspiring Dialogues session will take place on Tuesday 7 May. For this episode we will welcome Alumnus of the Year 2018 Ionica Smeets. Registration will open later but please save the date and keep an eye on this website. So you’re going to be an engineer, but what’s next? Role models, good examples, and best-practices can give you some sense of direction and insight into the possibilities that lie ahead of you. Fortunately, Delft University of Technology has some wonderful and successful alumni, and we want you to meet them! The Alumni Relations Office and Studium Generale are launching a new series called Inspiring Dialogues: interactive interviews with renowned TU Delft alumni that will give you, the students, a chance to meet and talk to inspiring people that will help you skyrocket your career! 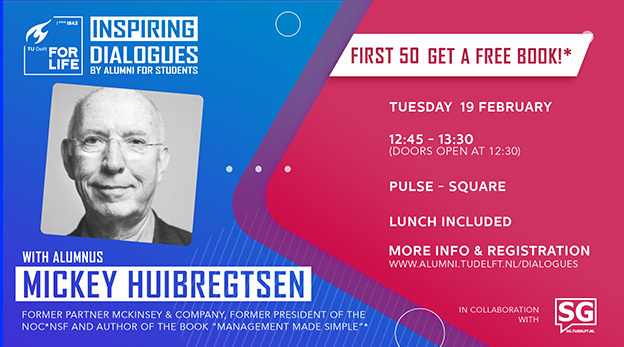 For the kick-off of the Inspiring Dialogues, on Tuesday 19 February 2019 at Pulse (Square), we have invited Mickey Huibregtsen. He graduated from TU Delft in the nineteen-sixties and went on to make a career as Partner at McKinsey & Company and chairman of the NOC*NSF (the Dutch Olympic Committee and Sports Federation). Mickey Huibregtsen recently bundled his experiences and expertise in the book Management Made Simple. In this first episode of Inspiring Dialogues he will share his vision and ideas with the next generations of leaders…that means you!